Boulder, Colo. March 12, 2019—The Brewers Association (BA)—the not-for-profit trade group representing small and independent craft brewers—today released its annual lists of the top 50 producing craft brewing companies and overall brewing companies in the U.S., based on beer sales volume. 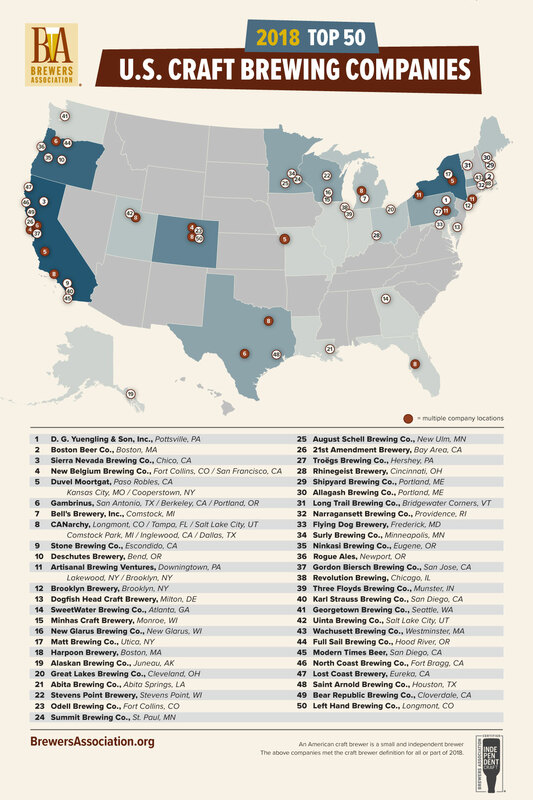 Of the top 50 overall brewing companies, 40 were small and independent craft brewing companies. “Although the market has grown more competitive, particularly for regional craft breweries with the widest distribution, these 50 small and independent brewing companies continue to lead the craft brewing market in sales through strong brands, quality, and innovation,” said Bart Watson, chief economist, Brewers Association. A comprehensive State of the Industry report will be delivered during the 2019 Craft Brewers Conference & BrewExpo America, held from April 8-11 in Denver, Colorado. The association’s full 2018 industry analysis, which shows regional trends and sales by individual breweries, will be published in the May/June issue of The New Brewer, available in May 2019.